Modern day Pakistan is viewed by the world as a violent place because of the government, tense relationship with the United States, and the Taliban. The Taliban, even though it is not part of the government, threatens the citizens of Pakistan and forces laws for the people to abide by; one “law” is for women not to be educated. Girls who attend school are threatened by the Taliban and eventually stop attending school out of fear of being killed by the Taliban. The Taliban would raid villages and inspect homes to make sure the girls and women were not reading anything that could benefit for an education. Those who spoke against the Taliban risked their lives; resulting many to stay silent, except for one teenage girl with an internet connection. When the Taliban came to threaten young girls while they were attending school, Malala Yousafzai hoped another child would not bend to their will, and when they came to raid the children’s homes, Malala hid her books under her bed knowing she would be killed if they found them (Brumfield, 2013). Malala used a blog, with permission from her father, to raise awareness about the situation young girls were going through with the Taliban, forcing them to give up their education all while revealing her appearance and identity. Her blog caught the attention of citizens of foreign countries and she became a symbol of hope and courage, which the radical Islamic organization saw as a threat to their cause; Malala was in terrible danger. She received death threats from the Taliban and random strangers regularly, but her courage and need to fulfill her duty to be an activist towards education overcame her fear. October 9, 2012, Malala boards a school bus to return home with friends. While on the bus she converses with friends like any other day, but the bus is stopped mid-trip. A man steps on the bus and demands for a “Malala Yousafzai”, a few girls point to the teenager out of fear for their lives. The man shoots two of her friends in non-lethal areas and then proceeds to shoot her in the head and neck. The man gets away and the bus driver mashes the gas to get away from any future attackers (Brumfield, 2013). Malala’s assault was a shock to the world and many foreign countries offered assistance in her recovery. Malala was transferred to Birmingham in the United Kingdom after being unresponsive for three days in intensive care in Pakistan for a few days (Brumfield, 2013). The world watched in horror waiting to hear news about Malala’s condition. Was she going to survive? If she survived would she be able to return home safely? Would the Taliban strike again? The surgeons at the Queen Elizabeth Hospital in Birmingham did everything they could to help Malala and to comfort her family as much as possible during their stay. Malala survived the attack and made it through the surgery. She stayed in Birmingham for almost four months before she was discharged as in in-patient in February (“Malala Yousafzai Discharged from Hospital”, 2013). 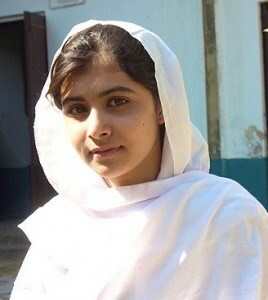 Malala and her family were able to stay in the United Kingdom during her rehab where she could rest and recover safely. As soon as she was able, she wanted to know where her books were so she could continue reading and studying for exams for when she returned (Brumfield, 2013). During her surgeries, the Taliban announced they would continue to find her and kill her should she survive the first time. Malala’s recovery was miraculous and the world was relieved she did not receive any permanent major nerve or brain damage; "Today you can see that I am alive. I can speak, I can see you, I can see everyone and … I am getting better day by day. It's just because of the prayers of people. Because all people – men, women, children – all of them have prayed for me.” (Yousafzai, 2013, February 5). Malala returned to school, but now she attends a school with a gate and guards so she may be protected from future assaults. Important politicians such as the Pakistani president, Asif Ali Zadari, and Hilary Clinton have acknowledged her and have given them their full support in helping her with her mission. Celebrities such as Angelina Jolie and Madonna have supported her by donating large sums of money to charities supporting Malala’s cause and have passed on the word of how amazing she is. Citizens of Pakistan and other countries rallied to honor Malala’s courage and express their opinions of the Taliban with posters saying “Malala, our prayers are with you” and “Shame on you, Taliban” (Brumfield, 2013). She was also honored with Pakistan’s first National Peace Prize in late 2011 for her writings from her online diary before the assault from the Taliban (Brumfield, 2013) and is also the youngest person nominated for the Nobel Peace Prize (Yousafzai, 2013, March 8). Malala has become an international symbol of courage, hope, and is one of the top activists for children who are unable to have an education. There have been charities and scholarships that have opened in her honor to continue her cause, particularly the Malala Fund, which she hopes to manage herself once she is old enough (Gibson, 2013); “…I want to serve. I want to serve the people. I want every girl, every child, to be educated” (Yousafzai, 2013, February 5). With her other accomplishments, Malala is still continuing her blog and she will have a book published, “I Am Malala” the fall of 2013 (Yousafzai, 2013, March 29). Malala is a strong young woman who has gone through more than most people have endured their entire lives. She continues to be courageous no matter how life threatening the situation and will continue to do so until she sees her dream of education being available to all children all over the world. She has accomplished so much just by finally having her voice heard and breaking the ice, but she remains humble and sees her goal as a duty she must fulfill. Malala is an honorable woman, yet she is still a teenager. It would be amazing to see how far she will go as she grows up and continues to fight for her dream.